We are a young family with 4 wonderful children who have started a journey around the USA in order to find the best possible spot to settle down and homestead. We have become members of WWOOF USA. And now we are traveling from our current home state of PA across the northern US. We have been establishing contacts with organic farmers in each state on our planned route, and will be wwoof-ing on their farms for various lengths of time. At each stop we will work as farm volunteers (aka "woofers") and learn as much as possible about organic gardening, sustainable living, alternative energy sources, tending to animals, starting a CSA, building straw bale constructions, and much more. Basically, all our family members will be actively involved in those farm operations, and the search for a perfect homesteading site for us will be on. Our "home away from home" is a 1977 Airstream Land Yacht that has a kitchen, a bathroom, plenty of storage, two twin beds and a sleeper sofa. And what's more, it draws constant smiles and friendly greetings. Let us introduce ourselves in a little more personal manner. The head of our family, named Mirek, is a young lad, age 33, who has a great witty mind and a gift for fixing just about anything. He loves to learn new languages and plays guitar, mandolin, mouth harp and harmonica. Over 10 years of experience working in our small construction business has taught him everything there is to learn in the field. He loves to work with wood; he loves to fish even more. In addition, since he grew up having a family garden and a mini homesteading operation in his homeland, the Czech Republic, organic gardening has always been a draw for Mirek. The neck of the family, named Julia, is a young gal, age 34, who loves to cook, bake, sew, draw, do photography, read, write, do crafts, and raise our beautiful children. Last year she began learning to play piano. Julia enjoys participating in hiking, biking, camping, fishing, canoeing, skiing and other outdoor family adventures. She is a teacher by profession, but her classroom has been their four homeschooled students so far (ages 8 years to 20 months). 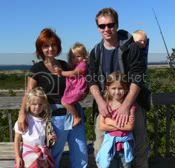 Julia is originally from Russia and teaches her children to speak her mother tongue. Daughter number one, named Ivana, is at the tender age of 8. She is a great help with all chores, loves animals (goats and horses in particular), plays violin, loves to read, and asks us every day when we are going to have a farm. Daughter number two, named Leona, is at the sweet age of 6. She is very reliable when asked to watch her baby brother. Leona loves to draw, read, help Mom and Tata, is learning to ride a bike, and asks us every day when we are going to have a dog. Daughter number three, named Milana, is at the cute age of 3. She is a lovable child and will steal your heart away when you hear her recite nursery rhymes. She loves to paint with water colors, read, dig in the dirt, and asks us every day when we are going to New Zealand. Son number one, named Evan, is at the daring age of 20 months. He loves to play with rocks and water, tries to keep up with his older sisters, and has not asked us any questions yet. We are planning to cover over 10,000 miles, visiting over 20 states in three months. When the seasons change we plan to turn south and explore the organic farms in that area. In taking upon a road trip of that scale we have a vision to encourage other families to do the same if they feel that their current life situation brings little happiness, and they want to go back to working the land. For those who are not in a position to personally travel, we hope to be a wonderful resource to rely on while making a decision to pick a perfect homesteading spot for their family. Wish us "bon voyage" and stop by often!